A long, long time ago, in a galaxy far, far away. Oh, wait, maybe it was this galaxy, but still a long, long time ago, when I was a teenager and dinosaurs roamed the earth. I wrote my first full-length (and full-of-cliches) novel when I was 21, but raising a family pushed out my serious writing for several years. They sneak up on me everywhere. A funny line (How to Stuff a Wild Zucchini, Remember the A La Mode) might strike me as perfect for a title (I do love a title that can make me laugh). Sometimes an interesting, heart-warming situation will evolve into a novel (Baby Mine, No Sudden Moves). A conversation between friends can form the concept for a mystery series, especially when those friends feel like bad mothers because their children are struggling and the series is titled The Bad Mothers Club. I have so many book ideas and even books plotted that I'll never have time to write them all. HOW DO YOU PLOT YOUR BOOKS? 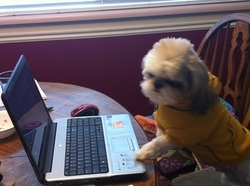 YOUR DOG CLAIMS TO WRITE YOUR BOOKS. IS THAT TRUE? Absolutely not. I deny it emphatically. He is out of control. He can claim all he wants, but that doesn't make it true. But it is true that he is very cute. You can read his lies (and occasional truths) in My Dog's Blog.